3Macs is an independent, employee-owned investment firm with offices in five Canadian cities and over 150 years of client trust and service. MIC operates as the investment counselling arm of 3Macs and specializes in discretionary investment for individuals, private corporations and foundations. The firm has developed tremendous brand equity with their longstanding history of delivering the 3Macs Promise to their clients. HTC aimed to strengthen their message of commitment and trust by delivering a thoroughly informative and resource-oriented site, and furthered this strategy in a follow-up expanded and redesigned website, featuring individual advisor profiles and comprehensive research. The equity built around the 3Macs brand was extended to MIC through its own site that uses similar layouts, colouring, imagery and messaging. 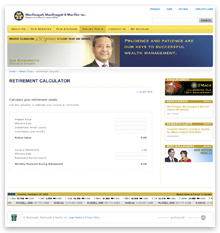 In 2004, 3Macs needed a new website to communicate more effectively with their clientele and reflect their prestige as one of the oldest independent investment firms in Canada. HTC designed a slick, authoritative and bilingual website to deliver 3Macs clients the tools and resources they require to make sound investment choices. 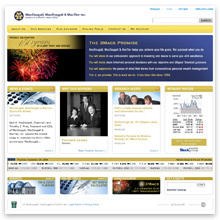 Four years later, to celebrate 150 years in business, 3Macs wanted to go all out by relaunching their website to feature individualized and self-administered investment advisor pages, more online tools and a research alerts system, all powered by IgnitionWeb. In 2011, MIC needed an autonomous information resource with the same sleek and sophisticated branding that inspires trust and confidence among 3Macs investors. Administrator Manager, Content Status Manager, Media Centre, EasyText Editor, Advisors Manager, Research Manager, News Manager, Library Manager, Links Manager, Promotions Manager, Site Statistics and Search Tools. Customized integration of third party content (Stockgroup and Accport), developed Advisors Manager allowing brokers to self-administer individual investment advisor pages in French and/or English, created Research Manager to handle research alert postings, with a full archival system and Promotions Manager to highlight online tools and services. 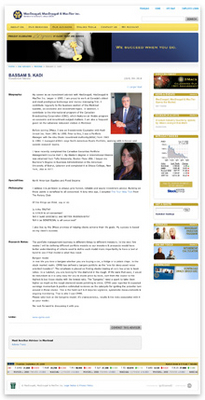 The employee-owned firm can now spotlight their highly qualified advisors effortlessly, giving them an opportunity to create their own profiles presenting their credentials, investment philosophy and recommendations to the general public and current 3Macs clients, while administrators monitor and approve content seamlessly and discreetly using IgnitionWeb. Their sleek look and sophisticated array of financial tools have received a great response from users, who greatly appreciate being able to view and compare advisor profiles online. MIC is benefitting from the extensible nature of IgnitionWeb by launching an entirely new site that retains the familiar functionality and enduring, compelling branding that has been so valuable to 3Macs over the past several years. By leveraging existing design and development, MIC was able to capitalize on the equity surrounding the 3Macs brand in a timely and cost-effective fashion within a single IgnitionWeb installation.